Tops Day Nurseries, based in Corfe Mullen has collaborated with Streets Meadow Care Home to bring the young and old together. There has been a rise in the press showing the benefits of children visiting care homes, both to the residents and the children themselves. Residents often report high levels of loneliness and care home staff note an increase in their mood, health and interactivity after visits. The nursery has been regularly visiting the care home over the past year, and the children enjoy the time spent with their elderly friends. During a recent visit, Tops Day Nurseries introduced the lively music and movements of Boogie Mites, a fun, educational dance and music activity. Sian Pistell, Deputy Manager at Tops Corfe Mullen said “We take the children to Streets Meadow because we believe it has benefitting factors on both our children and the elderly in care. The children walk in and the residents’ faces light up with excitement! 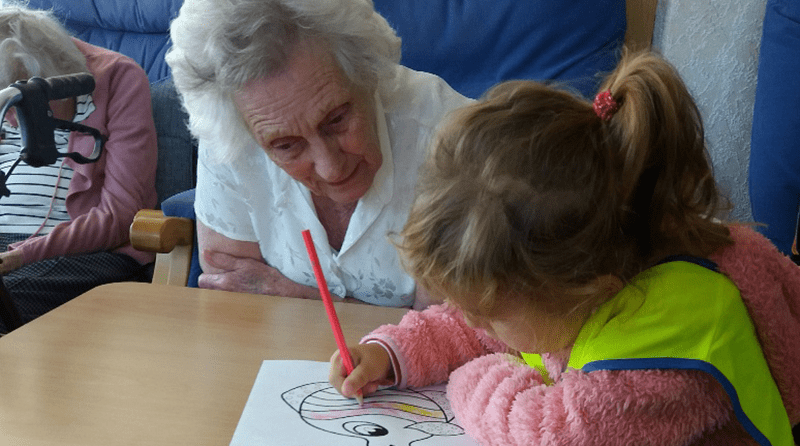 Some of the residents are grandparents and have visits from family members, but others do not, so they really appreciate care home visits from the children. During the visits, children learn about the differences between generations and about the world they live in. They understand that sometimes they need to speak quietly, but sometimes it is necessary to speak more loudly if an older person is having difficulty hearing them.